Westward propagation and the dynamics of intensification of Lakshadweep low (LL) have been investigated in detail. 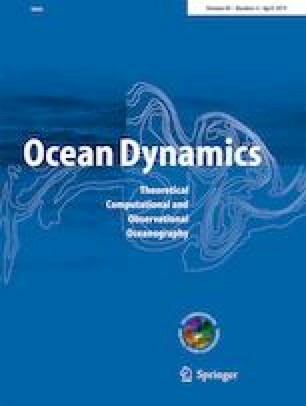 In this study, it is observed that LL is not propagated westwards in a single stretch to the western boundary of the southern Arabian Sea but takes place in multiple phases of propagation as well as through multiple eddy formations. LL forms in the southeastern Arabian Sea during the end of May and translates westward and propagates northward and southwestward due to the influence of surface currents existing in the region. LL propagates westward approximately along 7° N and intensifies throughout its westward track nearly up to 55°E, where it gets annihilated with time. The intensification is attributed to the cyclonic vorticity induced due to the meridional shear in the zonal velocity component of eastward flowing Wyrkti jet existing in the region. The intensification of LL is inferred from the decrease of sea surface height anomaly (SSHA) as well as from the uplift of thermocline depth at the core of LL. The region of cyclonic vorticity propagates westward concurrently with the westward progression of the core of Wyrtki jet. The first two authors are grateful to Cochin University of Science and Technology (CUSAT), Kochi and third author are grateful to the Director, Indian Institute of Tropical meteorology (IITM), Pune, India, for providing the research facility. The authors are obliged to Asia Pacific Data Research Center (APDRC) for providing the data sets to carry out the research analysis. The authors are deeply grateful to the reviewer for the elaborative and constructive review. The authors acknowledge support from Department of Science and Technology (DST) in the form of a Science and Engineering Research Board (SERB) project (EMR/2016/003682).